SEATTLE – The Seattle Storm today announced that Noelle Quinn, a 6-0 guard and former No. 4 overall draft pick, has re-signed with the franchise. Quinn, a former standout guard at UCLA, recently capped her 11th season in the WNBA in 2017, averaging 2.7 points and 2.8 assists per contest while coming off the bench for the Storm. After playing two years in Seattle between 2013-14, Quinn signed with the Phoenix Mercury in 2015. She was ultimately traded back to the Storm on June 25, 2016, and has remained in the Emerald City ever since. Quinn has appeared in 118 games overall, compiling averages of 3.6 points and 1.9 assists per contest. 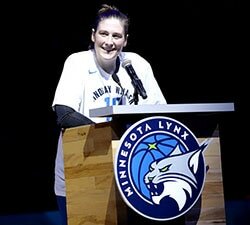 Quinn’s WNBA career began in 2007 after the Minnesota Lynx drafted her as the No. 4 overall pick. As a rookie, Quinn recorded 19 starts in 34 games, totaling 2.8 points and career-best 4.4 assists per game. 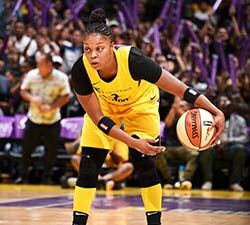 She spent two seasons in Minnesota before returning to her hometown of Los Angeles via a trade with the Sparks, where she played three seasons and in 2010 averaged career highs of 10.2 points, 4.0 rebounds and 32.5 minutes per game. She was then traded to Washington in 2012, spending one season with the Mystics before making her Seattle debut in 2013. While playing for UCLA between 2003-07, Quinn’s versatility caused nightmares for opponents, as she hurt her defenders both from the perimeter and in the paint. For her career, the former Bishop Montgomery High School standout compiled 1,829 points, 794 rebounds, 450 assists and 196 steals. She led her team in nearly every statistical category her final two seasons, and as a senior was one of the 12 finalists for the State Farm Wade Trophy. Quinn capped her career by notching her third First-Team All-Pac-10 honor, and she also earned AP Honorable Mention All-America and Honorable Mention WBCA-Kodak All-America plaudits during her senior season. 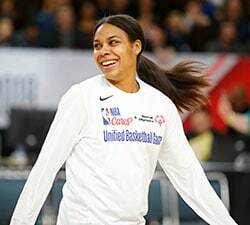 Following the 2016 and 2017 WNBA seasons, Quinn returned to Los Angeles to coach girls basketball at Bishop Montgomery, where she was also the first in her high school’s history to have her jersey retired.